Home Apple Is Galaxy Note 7 is the iPhone You Wanted? Is Galaxy Note 7 is the iPhone You Wanted? : Samsung finally get started to launch best lineup ever as earlier this year have launch Galaxy S7 and yesterday Galaxy Note 7 best Note ever. Note 7 and S7 might share some similarities from internals including Camera, Processor, Display and Wireless Charging. Apart from these Note 7 include some interesting feature which is new to any smartphone line as new S Pen which now can understand pressure variations like Apple Pencil which make Note 7 a best device for personal canvass. Apart from these Note 7 include new Iris Scanner which another interesting feature and most secure way to unlock device. Samsung also have new Type-C connector which is first in Samsung lineup as it also increase transfer speed and syncing of device very fast. Further upgrade from predecessor Note 5 as Note 7 now have IP68 Rating which means Note 7 is waterproof and dust proof while S Pen also have IP68 Rating. Note 7 has 500mAh more battery as Note 5 has 3000mAh while Note 7 has 3500mAh which make your device run more longer. Note 7 has new design as it include new dual edge screen which makes the device to hold more comfortable. As these feature looks like Note 7 is just a makeover of Samsung Galaxy S7 Edge with S Pen, Iris Scanner, Larger Display and the answer is Yes. But if we compare Note 7 with its rival Apple iPhone 6s Plus things are pretty difference in both these devices as we look the iPhone from Spec sheet it looks so dump phone ever created in this year but if we look real world scenario of both these devices answer may be different while in our conversation we will give you both the scenario as our conversation going on. So let’s get started. If we look spec reason there will surely you think one device clearly winner but you have chosen one. Apple iPhone 6s Plus has Apple A9 Chipset which is Dual Core clocked at 1.84Ghz Processor with 2GB of LPDDR4 RAM as this processor is capable of doing any task without any lag hiccups Games and Apps runs flawless without any issue and with integration of iOS 9 really opens device capability what it can do. While Samsung Galaxy Note 7 include Snapdragon 820 which is Quad Core Processor with 4GB of LPDDR4 RAM as this much amount of RAM is good for heavy multitasking and device won’t feel any hiccups or lags. As we see processor point of view of both these device which clearly show Note 7 has higher spec but iPhone 6s Plus optimisation is better than to run under power cpu so this session pretty hard to choose a winner while Note 7 lead this session as it has Quad Core CPU and 4GB of RAM. Gaming on both these device really gives awesome experience as iPhone 6s Plus as Metal API for Gaming which really gives Console level graphics in while Galaxy Note 7 also have Vulkan API which also gives the same type of gaming experience so this session is tie for both devices. Camera on both devices are best of class and know among user as iPhone 6s Plus has 12MP Rear iSight Camera with many sensor and enhancement while Galaxy Note 7 also have 12MP Rear Camera with all the same sensor as Galaxy S7. Both these devices have same sensor while this section lead by Samsung Note 7 as it has best snaps in both light situation as night imaging of Note 7 best in among all smartphones. Front camera of both these device has 5MP sensor with front flash in Note 7 and Retinal Flash in 6s Plus. Display on both these device are tremendously awesome as Note 7 lead this session as it has same Galaxy S7 display which is AMOLED Q-HD display of 2560×1440 resolution screen which produce awesome color and nice texture out it. While iPhone 6s Plus has Apple’s Retinal HD display which is based on pixel technology which harder detect by human eye. iPhone 6s Plus has F-HD resolution which is also good in color saturation and reproduction but sharpness and live like effect will see in Note 7 so Note 7 also take this session. For screen toughness Samsung uses Cornering Gorilla Glass 5 while iPhone uses new ion Strengthen Glass while Note 7 has tougher screen than iPhone 6s Plsu while Note 7 uses Gorilla Glass 5 on both side. Feature is most important topic for both these device as both are having different feature but also include some similar one. While we start from similar one iPhone 6s Plus and Galaxy Note 7 both having fingerprint sensor for unlocking device while iPhone 6s Plus sensor is very fast which unlock device within flick of eye. iPhone 6s Plus comes with 3D Touch display which really make work more easy with pressure of your finger and also make doing things very easy. While 3D Touch won’t able to cover up whole interface for user usage but Apple implemented 3D Touch in upcoming iOS 10 which really enhances the way we use iPhone. 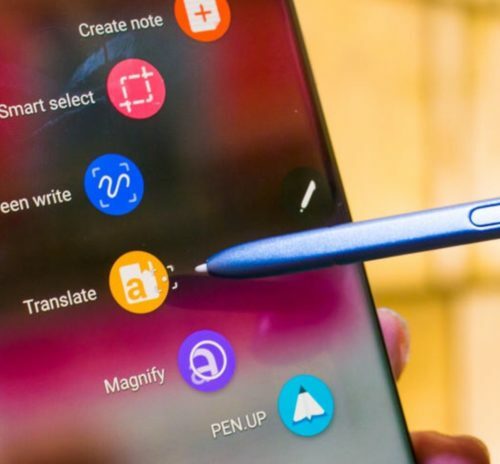 Note 7 uses pretty different feature which make Note 7 a Note device S Pen which unlocks power of Note devices and which makes it famous as S Pen also capable of detecting pressure and imprint on-screen as you are writing on Notebook. Note 7 also feature Waterproofing and Dust proofing which is obsolete from iPhone while iPhone 6s has water protecting label inside it so water won’t come easily. While Galaxy Note 7 is capable to use in any surrounding swimming pool or in sandstorm Note 7 won’t las this feature. New Feature include Iris scanner which is exclusive to Note 7 and not in iPhone make Note 7 to take leap ahed of Apple as this biometric password is more secure than our fingerprint sensor. Galaxy Note 7 also have Wireless charing which also charges device faster than iPhone 6s. While Wireless charging is cool way to charge your device without being wall hugger. So feature wise both device have different one to proof better but they are different categories of devices so it pretty hard to choose a winner. Both device has best in class interface as iPhone has iOS while Note uses Android interface. Rivalry between iOS and Android is also another topic of discussion but the basic difference is that Android is pretty open source software while iOS comes with limited access to APIs. So both device receives ties in section. But both devices are best optimise for best usage and bring out different artistic view from you. Galaxy Note 7 is giving hard competition to iPhone 6s Plus including new Iris sensor, S Pen and Larger Display apart from these iPhone 6s Plus Simplicity, Optimisation, Apple Services (iCloud,iTunes and much more), 3D Touch, Design and more also stop Note 7 to taking lead. While both these devices are best from there manufacturers and also lies in the heart of fans. So after reading this you’ll realises that both these devices are featuring best out of it and it is pretty hard to choose from both of these. So make your decision and let’s us know about that in comment section down below.